Create invoices and documents with one click. WebMerge is the only document generation solution you need to save time, put a stop to manual entry, and streamline your paperwork process. Build documents from scratch or upload your own Word, Excel, PowerPoint, or fillable PDF files. Send documents via email or use a third-party integration to save and deliver files anywhere. Populate documents in seconds with data from a third-party app, CSV file, or API integration. Build any document you need. WebMerge allows you to create any type of document with ease. Below are just a few of our most popular. Create customized contracts and agreements that will streamline getting business done. Collect your rent applications online and send a copy to the applicant for their records. Populate and generate those pesky (but required) government forms automatically. Automatically create tickets for concerts, sporting events, charity dinners, and more. Save your patient intake forms in a readable format and send them to a secure document repository like Box. Automatically create professional looking proposals with calculations, charts, and more. We integrate with your favorite apps. Here are just a few of the third-party apps that WebMerge integrates with. Automatically import data from your Salesforce objects and generate PDFs and more. Share documents generated by WebMerge with the rest of your team on Google Drive. Integrate with hundreds of web services to automatically generate documents. 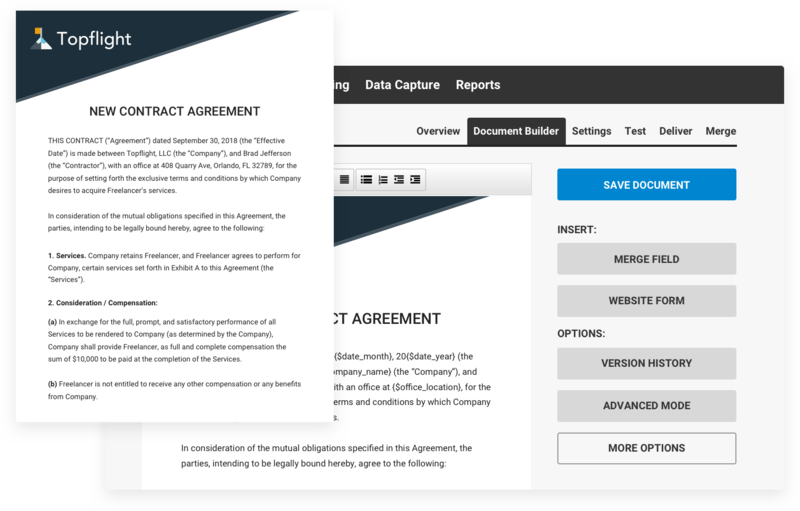 Generate dynamic contracts and approvals and easily get them signed using DocuSign. Import data automatically from your online form and create a PDF from form submissions. Sync Box to automatically save your merged documents to Box's secured cloud storage. Don't take our word for it, hear it from our customers. We save 20-40 hours per month with WebMerge. We replaced DocuSign and Word with Formstack, WebMerge, and RightSignature, and our clients experiences are more consistent and intuitive now. There is still evil and disease in the world, but here at Handbid, our lives have gotten a lot better because of WebMerge :). Before WebMerge, we were manually processing documents. Now, we save 3 hours a day. WebMerge can potentially mean the difference between life or death for the people we are trying to help.